Join a Scentsy World Tour event for consultant training and product reveals. The Scentsy Spring Training in the US used to be Scentsy Spring Sprint, but Scentsy changed it to Scentsy World Tour to all be uniform across all Scentsy regions. So, we now have one big Scentsy World Tour! Scentsy corporate home office is traveling the globe on a Scentsy tour to showcase the latest Spring/Summer 2019 products and provide training to help you set your Scentsy business on a course for success. Each Scentsy World Tour event includes on-site training and a sneak peek at the upcoming products in the new catalog. The Scentsy home office team is circling the globe to provide training and showcase the latest Spring/Summer 2019 products to set your business on a course for success. 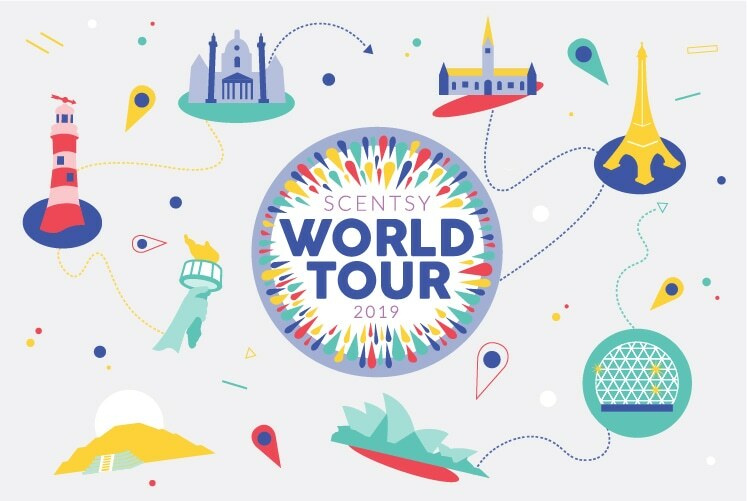 So where are we going on our Scentsy World Tour 2019? Check it out! Bring as many guests as you’d like for just $30 USD/$40 CAD each. They’ll experience Scentsy Spirit firsthand and even participate in the giveaways. No one will leave empty handed! Registration will opened on the Events tab of your Workstation on Nov. 13, 2018 and closed Jan. 11, 2019. If a location is not sold out, Scentsy is accepting walk-in registrations this year. Make sure you register to join us at Scentsy World Tour 2019! Not a Scentsy Consultant but you would like to be, and join in on fun trainings and experiences like World Tour? Come join me and start your own Scentsy business today!